At Gulf Coast Regional Blood Center, we pride ourselves on being a career destination location for laboratory professionals. 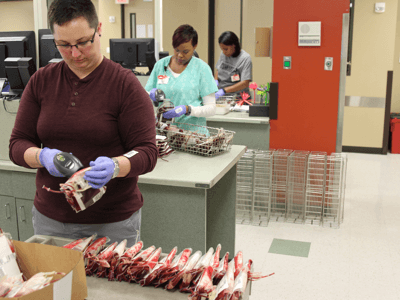 Gulf Coast Regional Blood Center has exciting opportunities for laboratory professionals to excel in their career in our Consultation and Reference, National Donor Testing Services and our Quality Control Laboratories. Our lab technicians work diligently to perform specialized testing to ensure we are providing compatible blood products to our patients. Highly trained, board certified specialists in this AABB Immunohematology Reference Laboratory resolve complex patient antibody cases received from local and regional hospitals. Skilled technologists perform specialized testing to provide compatible blood products. The lab also manages a nationally recognized rare donor program, storing and providing rare units for those patients who need them. Qualified individuals with education and experience in special chemistry, immunohematology and molecular testing perform a variety of EIA and nucleic acid tests to detect disease markers (like HIV and West Nile Virus) and blood typing (ABO/Rh) on all units collected at The Blood Center. 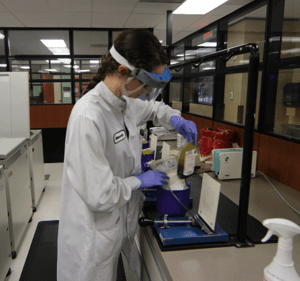 This laboratory performs testing for a number of clients from around the country and participates in clinical trial testing to aid in the development of new reagents, testing methodologies, and/or quality control testing. Employees perform quality control testing on blood components (random and apheresis platelets, red blood cells and cryoprecipitate) as well as calibration, validation and preventative maintenance apheresis collection and other instruments. The department’s activities are critical to the acceptability determination of all blood components manufactured at The Blood Center. Gulf Coast Regional Blood Center provides many continuing education opportunities including lecture recordings, e-GRIPS, web-based training on Gulf Coast Regional Blood Center's manufacturing process and audio conferences. We provide clear career paths and opportunities for growth within our organization.